The San Francisco City Hall was built in 1906 as a replacement of an Old City Hall was completed in 1899 after 27 years of planning and construction. The building was completely destroyed by an earthquake in 1906. The current The San Francisco City Hall was built in between 1913-1915 at a cost of $3.4 million. The building has the fifth largest dome in the world. It was slightly damaged onn October 17, 1989 when an earthquake of magnitude 7.1 hit San Francisco. Modeled on London’s Big Ben and built from honey-coloured oolitic limestone imported from Bath in England. Cape Town City Hall was built in 1905 by Messrs Henry Austin Reid and Frederick George Green. This is where Nelson Mandela made his first public speech after his release from Robben Island on Sunday 11 February 1990. The Basilica of the Sacred Heart of Paris, commonly known as Sacré-Cœur Basilica and often simply Sacré-Cœur (French: Basilique du Sacré-Cœur, pronounced [sakʁe kœʁ]), is a Roman Catholic church and minor basilica, dedicated to the Sacred Heart of Jesus, in Paris, France. A popular landmark, the basilica is located at the summit of the butte Montmartre, the highest point in the city. Sacré-Cœur Basilica is a double monument, political and cultural, both a national penance for the supposed excesses of the Second Empire and socialist Paris Commune of 1871 crowning its most rebellious neighborhood, and an embodiment of conservative moral order, publicly dedicated to the Sacred Heart of Jesus, which was an increasingly popular vision of a loving and sympathetic Christ. The Sacré-Cœur Basilica was designed by Paul Abadie. Construction began in 1875 and was finished in 1914. It was consecrated after the end of World War I in 1919. New Town Hall, Neues Rathaus, is a Flemish Gothic style building built between 1867 and 1874 to house government offices of the rapidly growing city of Munich. The building was later extended with the addition of a tower and the Glockenspiel. These extensions were completed in 1909. The tower is 79 m (259 ft) tall and is quite a dominant feature in the building. 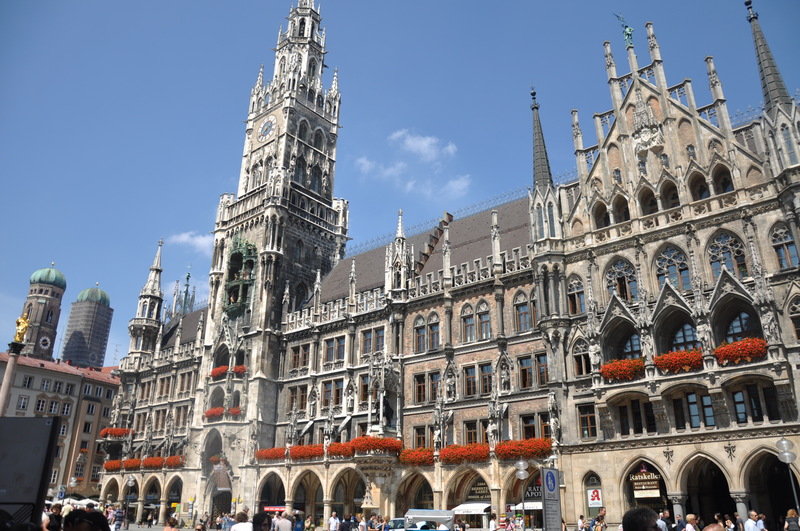 The Glockenspiel is a famous tourist attraction in the area, it consists of 43 bells and 32 life-sized figures. It shows a number of interesting displays at 11 a.m. (as well as 12 p.m. and 5 p.m. in summer) daily. 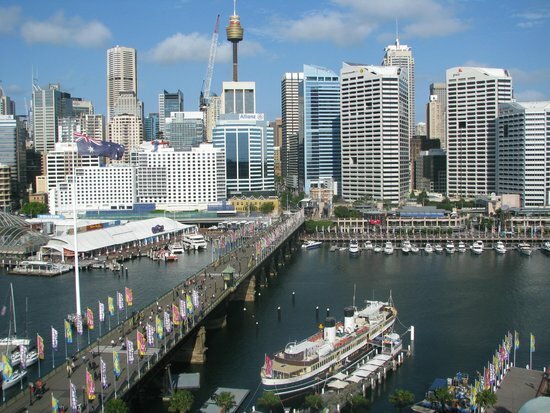 Darling Harbour is a harbour adjacent to the city centre of Sydney, Australia. It is also a large recreational and pedestrian precinct that is situated on western outskirts of the Sydney central business district. The locality extends northwards from Chinatown, along both sides of Cockle Bay to King Street Wharf on the east, and to the suburb of Pyrmont on the west. Cockle Bay is just one of the waterways that makes up Darling Harbour, which opens north into the much larger Port Jackson. The precinct and its immediate surroundings are administered independently of the local government area of the City of Sydney, by a New South Wales state government statutory authority, the Sydney Harbour Foreshore Authority. The Antwerp City Hall( Antwerp Stadhuis) is a Renaissance building designed by Cornelis Floris de Vriendt, it was built between 1561 and 1564. The 56 metre high city hall was a replacement of an old 15th century building, which was small for the growing city of Antwerp. Antwerp City Hall was burned down in 1756 during the Spanish Fury, which caused half of the city’s population to flee. It was rebuilt in 1579. The last major renovation was in the 19th century, which aimed to modernise the building. Most of the renovations were interior. Also known as Cloth Hall, Sukiennice was first built in the 11th century. The building was rebuilt after it caught fire in 1555. Sukiennice was also a major centre of international trade during the Renaissance which is considered to be the Golden Age of Polish culture.